• How to participate ? NEW! Look at the "bande annonce"
This year, Italy attracted the « look on a country » of the festival. In a partnership with the Italian Cultural Institute of Marseilles, the festival has wished to hail the work of Mirco Mencacci, sound designer and film music producer, by giving him “carte blanche”. This is not a random choice. 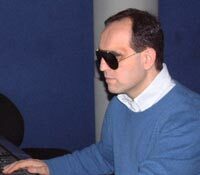 Mirco Mencacci lost his sight at the age of 8, and still he works as a professional in the most visual of arts: the cinema. Through the free choice offered by the carte blanche, we question him about his relation with the image. He proposes the documentary “Altri occhi” by Guido Votano, as well as a short by Michelangelo Antonioni “Lo sguardo di Michelangelo” and a documentary “El barrilete” by Alessandro Angelini. Answering to its main mission, the Italian Cultural Institute of Marseilles, funded in 1953, presents a very diversified cultural programming with the main concern of getting its public to know or to discover the artistic contemporary Italian production in all its fields, without forgetting the classics… The Italian Cultural Institute of Marseilles also proposes lectures of Italian language and civilization, lectures of conversation, workshops of translation and workshops for children. The partnership with the Aubagne International Film Festival stands in continuity to the work related to cinema that the Institute started several years ago. The presentation of the Italian sound designer Mirco Mencacci’s work finds a natural place into this festival, which highlights the links between sound and picture. The Institute encourages the promotion of the contemporary Italian cinema in the south of France through the organization of events in its own screening room or in the local cinemas. Open-minded, the Institute is used to working in collaboration with a lot of cultural partners; it is for us a pleasure and an honour to be part of the Look on a country of the Aubagne International Film Festival, devoted this year to Italy.